Fabinho “made a big difference” after replacing Jordan Henderson in Liverpool’s 2-1 win over Tottenham, and Jamie Carragher believes he should keep his place. Jurgen Klopp pulled a surprise by omitting the Brazilian from his starting lineup at Anfield, instead opting for his ‘big game’ midfield of Henderson, James Milner and Gini Wijnaldum. The Reds won the numbers game in the middle of the park as injuries forced Mauricio Pochettino to name Moussa Sissoko and Dele Alli as a duo, but the quality and diversity were lacking. Fabinho eventually took Henderson’s place on 77 minutes, with the scores level at 1-1, and went on to make a vital impact, including two aerial duels and one big tackle won. Liverpool have just six games left in the Premier League, and will likely need every point if they are to pip Man City to the title, and for that they require their best players. 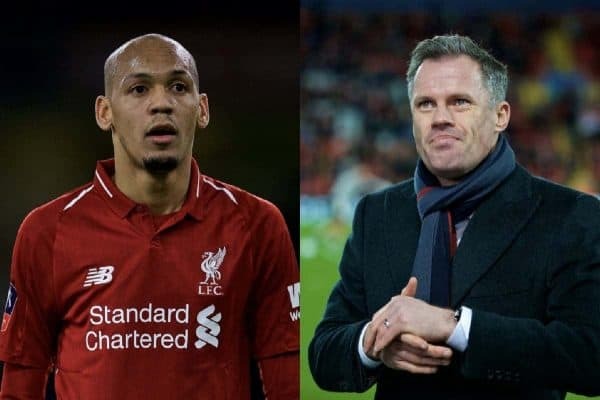 Carragher, speaking as part of Sky Sports’ coverage of the game, described Fabinho as one of those, and suggested he should start every game between now and May. “I thought he made a big difference when he came on. [Leaving him out] was a slight surprise,” he explained. “It could be any of three [that he replaced], it’s not a single person you point at. “[When Fabinho came on] his passing and how he wins the ball back quickly [were important]. It’s certainly a convincing argument, as while there is stability in the conservative trio of Henderson, Milner and Wijnaldum, there’s a clear lack of impetus. Starting Fabinho provides both a rock-solid spine and a forward-thinking midfield outlet, whether that be in a 4-2-3-1 or 4-3-3 system. The 25-year-old allows that versatility, as the setup shifted shortly before his introduction, and this will be crucial as six very different challenges await. 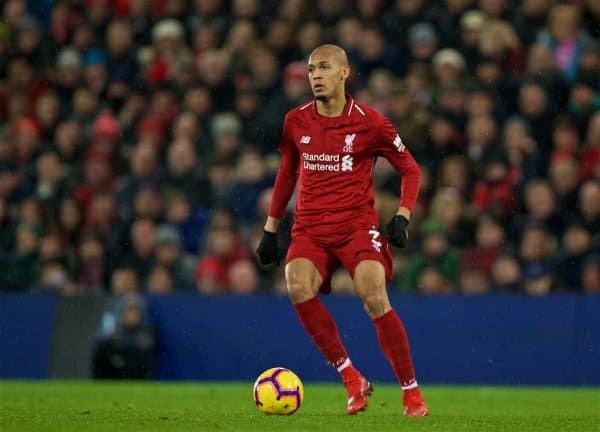 Klopp can be forgiven for naming Fabinho on the bench on Sunday, following his relatively late return from Brazil duty. But as Carragher argued, he should now return to being one of the first names on the teamsheet.